Thangtong Gyalpo was a great buddhist adept, physician, blacksmith, architect, and a pioneering civil engineer. 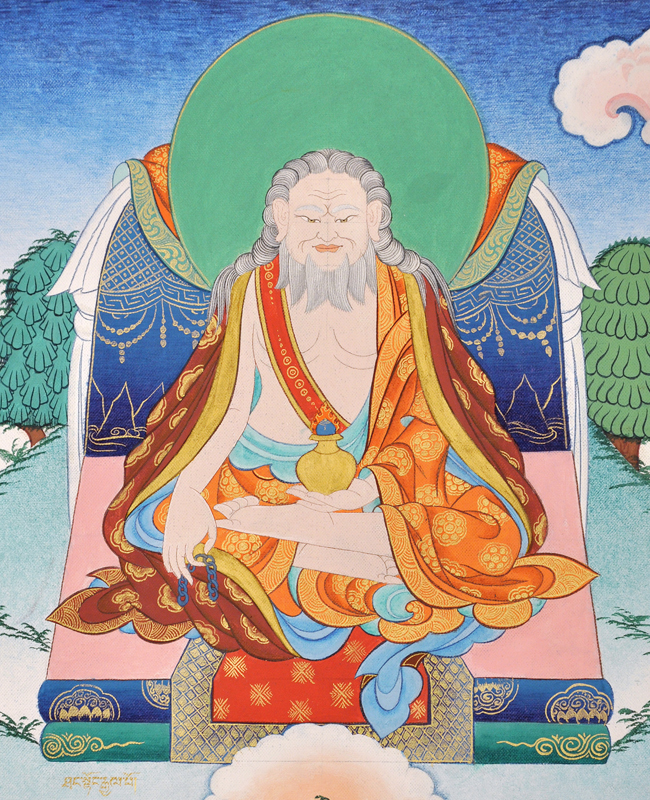 He proclaimed himself, and was considered, the incarnation of the illustrious Dölpopa Shérab Gyaltsen (1292-1361), a leading Jonangpa master and formulator of the Zhentong view of emptiness. He is said to have built 108 iron-chain suspension bridges (though another account says 58 suspension bridges and 118 ferry-crossings) around Tibet and Bhutan, several of which are still in use today. He also designed and built several large stupas of unusual design including the great Kumbum Chörten at Chung Riwoche in Tibet; established the monastery of Dergé Göngchen (Göngchen Monastery) in Eastern Tibet; and is considered to be the father of Tibetan opera. He is associated with the Shangpa Kagyü, Nyingma and Sakya traditions of Tibetan Buddhism. Thangtong Gyalpo was born at Ölpa Lhartsé in upper Tsang. He is well known for his founding of Aché Lhamo, the Tibetan opera, and the numerous iron suspension bridges he built to ease travel and pilgrimage though the Himalayas. He established a song and dance troupe of seven sisters to raise the money needed to build these bridges. He is also considered to be the patron saint of theatre and became known as ’the madman of the empty land’ (lung stong smyon pa). Plays traditionally have an altar erected in the middle of the ’stage’ surrounded by trees, where the ’god of drama,’ Thangtong Gyalpo, is worshiped as an elderly man with a white beard. Thangtong Gyalpo also founded Göngchen Monastery, a large Sakya Tibetan Buddhist monastery and printing centre in the town of Dergé, in Sichuan, China, previously the Tibetan region of Kham. At the south end of the Tsangpo bridge was Thangtong Gyalpo’s main seat, Chakzam Chuwori and he lived in the Chakzam Labrang, the main building of the complex which included the assembly hall. The monastery had a hundred monks supported by the toll on the bridge. There was also a large stupa known as Tangtong’s Kumbum at the southern end of the bridge which eventually contained his relics, and a chapel at the top, containing an image of him. Dowman reports that “all evidence of its existence has now vanished”. In 1433, Drubthob Thangtong Gyalpo and his disciples traveled to Phari in the Chumbi valley of Tibet, and from there to Paro Taktsang Senge Samdrup in Bhutan. According to his biography, while performing rituals of Vajrakila there, he had a vision of the assembly of the Eight Classes of Heruka (sgrub pa bka’ brgyad) meditational deities with Vajrakumara as the central figure. It is said that a nine headed Naga spirit who was the guardian of the sacred place of Paro Taktsang, declared “your religious inheritance was concealed here by Orgyen Rinpoche, please make your discovery and reveal it”. Thereupon Drubchen Thangtong Gyalpo extracted a sacred scroll ten body lengths long from the cliff of Taktsang. The line of mountains where Taktsang is located is shaped like a black snake with its head in the middle of the Paro valley. On the nose of this snake the Drubthob constructed Dumtseg Lhakhang, a stupa shaped temple and pronounced that all diseases caused by evil spirits residing under the ground were suppressed and that the valley would be free from leprosy. Tachog Lhakhang was established by Thangtong Gyalpo Arriving at a place called Phurdo, where he saw a five colored rainbow upon which were seated Buddha Amitabha, Avalokiteshvara and Padmasambhava and declared that the place was as sacred as Potala mountain. At Tachog-gang, at the foot of the Phurdo mountains, he established Tachog Lhakhang temple and made sacred representations of the Buddha’s body, speech and mind. 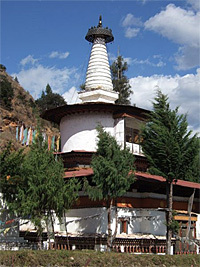 This temple, which is located opposite the road from Paro about 5 km before Chudzom, is still maintained by the descendants of Drubthob Thangtong Gyalpo. From there he travelled to Drawang Tengchin where a rich man named Olag presented him three hundred and forty coins and turquoises and requested him to extract water. He did so and the water was sufficient to feed not only the people and cattle but also irrigate the fields. He then arrived at Gophog and told Lama Gyaltsen that he needed large quantities of iron to help him build links for compassionate purposes. Lama Gyaltsen answered that he would make available one hundred pieces of iron if the Drubthob could show him a proof of his attainment. The Drubthob told him to bring a boulder that was near the bridge which he split it into two by just pointing his finger. Within the stone they saw a live scorpion, the size of a thumb with innumerable new-born scorpions. The Drubthob prayed in Samadhi and the insects instantly disappeared in the form of a rainbow and he proclaimed that he had sent them to Sukhavati. At Wundul Shari, he climbed a steep mountain cliff, impossible to climb by the ordinary humans and stayed there for a month. He said that the cliff contained caves like Tashigomang and the place resembled Shambala in the north. However, he said, as ordinary people could not go there, he had made a door. When the people looked up they found an opening that did not exist earlier on the face of the cliff. Then he travelled to Wündül, Gyaldung and Langsamar, and upper and lower Ha region. He converted the offerings that he received into iron and renovated the iron bridge there. Then he went back to Dromo Dorjé Gur in Tibet. From there, he travelled again to Thimphu and Thed valleys where he built an iron bridge at Bardrong. His journey then took him to Rued and Künsangling where Lama Thuchen presented him with two hundred and fifty pieces of iron. 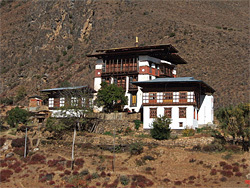 It is said that he also built the Chiwotokha Lhakhang (in Shar district) during this visit. He took all the offerings including the iron pieces to Paro, and turning himself into eighteen persons, he went into different villages such as Dölpophu, Tsharlungnang, Dungkhar, Jiwu, Nyagbu and Lholingkha, and instructed eighteen blacksmiths to forge iron links. After about three months, he had seven thousand iron links and many iron hammers and bars. At Kewangphug and other places, he built stupas to subdue the spirits of these areas. At Changlungkha Rawakha, Nyal Phagmodrong, Tachogang, Wündül Drönkar, Silung, Bagdrong, Binangkhache, Daglha, Gyirling and Nyishar, he conducted a lot of religious activities by providing image, scripture, stupa, iron bridges and established meditation centers. When he returned to Phari, the patrons and monks of the new monastery in Paro, had sent one thousand four hundred loads of iron (fifteen pieces of iron making a load), and seven hundred loads of ink, paper and other goods to Phari. Thangtong Gyalpo received the transmission of the entire Shangpa Kagyu lineage from Jangsem Jinpa Sangpo (byang sems sbyin pa bzang po), who had received it himself from several masters of various lineages. Right after having received the transmission, he went into seclusion and practiced the Shangpa precepts. This resulted in a pure vision of the ḍākinī of primordial awareness Niguma, and she accepted him as a direct disciple and granted him further transmissions and explanations. On several later occasions he had further visionary encounters with her and eventually composed many arrangements and instructions manuals, particularly on the “Six Yogas of Niguma”. Thangtong Gyalpo is said to have “passed away bodily, in the way of a sky-farer” in his 125th year at Riwoché. Adapted from Lama Shérab Drimé’s work.